Lithium is a naturally occurring alkali metal found in numerous foods and drinking water, especially that which comes from river basins and other fresh sources. Doctors prescribe high doses of lithium in drug form to stabilize the mood of patients with psychiatric disorders, including bipolar disorder. A study published in Current Alzheimer's Research in 2013 suggests that very low doses of lithium may ward off cognitive decline, such as what occurs with Alzheimer's disease. More research is required to make a definitive recommendation on treating dementia and Alzheimer's with lithium, and no recommended daily allowance has been set. Some foods, though, can naturally increase your intake of the metal and to levels that are unlikely to cause negative side effects. Most foods contain concentrations of just thousandths of a milligram. Lithium from water concentrates in crustaceans and mollusks, and to a very small amount in fish. This includes shrimp, lobster, oysters and scallops. Dairy, eggs and meat also contain slight concentrations of the trace mineral. Pulses, which are legumes and include dry peas and beans, lentils, chickpeas and soybeans, contain some of the highest amounts of lithium available in food. Vegetables, as a general category, contain significantly less lithium than legumes but are still a source. The sea vegetable kelp, blue corn and mustard from fresh mustard seeds also contain trace amounts of lithium. Grains, particularly wheat and rice products, contain small amounts of lithium. Pasta, as it is usually made with wheat, has small concentrations too. 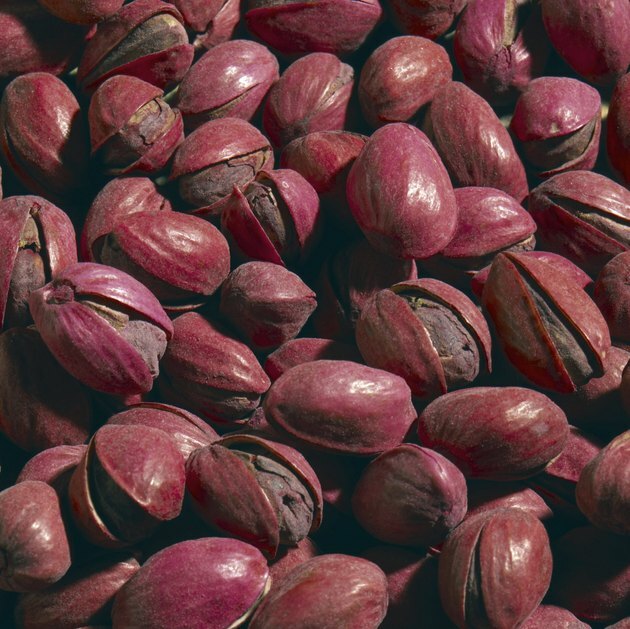 Pistachios are a known source of lithium, as is coffee. Dried fruits and seeds also contain minuscule amounts of lithium. An overabundance of lithium can slow cognitive processing, cause rapid heart rate and induce weakness, among a number of other serious side effects. You're unlikely to get enough lithium from natural drinking water and food to cause these effects, though. Doctors prescribe lithium in higher doses than you find in foods to treat mania and bipolar, along with other disorders caused by abnormal brain activity. You should not take prescription lithium unless under direct care of a doctor. Expert Opinion on Drug Safety: Lithium: A Novel Treatment for Alzheimer's Disease? Psychology Today: Could You Have a Lithium Deficiency? Does Stevia Affect Blood Sugar?